Cardeno C is quickly becoming one of my favourite m/m romance authors, especially for a quick, sweet romance. I adored Jared McFarland right from the get go. He's a sweet, shy farmer who wants that special someone in his life. You can feel his loneliness screaming off the pages, and your heart just breaks for him with it. Lucas is a spoilt little sh!t, no other words for him. I wanted to slap his pretentious sunglasses off his pretentious face the way he acted when we first met him! What I loved was how Jared and Lucas circled around each other, neither knowing that they were the other ones crush. I loved that Jared would not put up with any of Lucas' spoilt antics, and tells him so right up front. Rawwwr that's hot! And you just know that when these two get their act together it is going to be hot and explosive. And boooom it sure is. I did feel that Lucas' one-eighty from brat to caring, sharing lover was a bit quick - but then there is only so much time in a novella to get the story where it needs to go. Other than Lucas' head-spinning change, I felt that the rest of the story was very well paced and the story flowed well. So, will Lucas stay on the farm to be with Jared, or will the fast living city lifestyle call him back? Will our boy get their HEA? 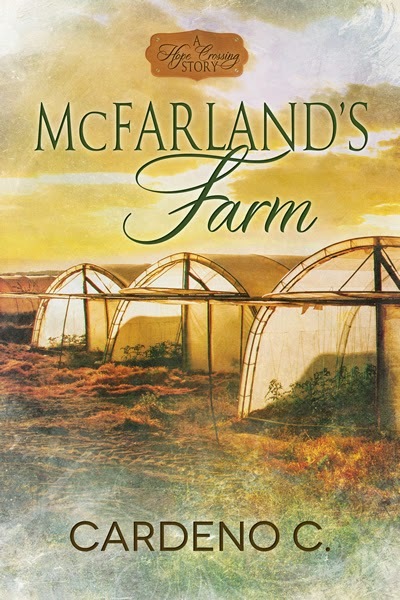 McFarland's Farm was a great introduction to a new series of novellas, and I will definitely be checking out more as they are released!